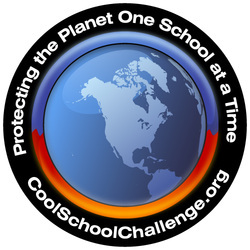 The Cool School Challenge is an educational program intended to engage students and teachers in practical strategies to reduce carbon dioxide (CO2) and other greenhouse gas emissions schoolwide. The Cool School Challenge can be administered by anyone your school designates to be a Challenge Coach, such as science, math or other teachers, administrators, or leaders of student organizations. The role of the Challenge Coach is to train, support and oversee the Student Challenge Leaders in implementing the program at your school. Student Challenge Leaders can be any interested class or group of students. Under the guidance of their Challenge Coach, they will learn how to conduct a classroom energy audit. They will then recruit as many classrooms as possible into the Challenge, helping them measure their CO2 emissions and then developing a strategy to reduce these emissions. Student Challenge Leaders monitor the progress of the participating classrooms and look for ways to motivate and inspire classrooms to achieve the greatest reductions possible.